I had a serendipitous visit from a friend this weekend - the kind of visit where you literally encounter each other in a random parking lot, and then immediately make plans to get together and catch up. I find these are both the best and worst kind of encounters. I love them, because it means you catch up with someone awesome that you haven't seen in a while, and then I hate them, because it reminds me of how bad I can be at keeping in touch with people. Because this meal was also serendipitous. This past week, I had diligently made my meal plan using the Fresh 20 service (which I love and use sometimes, but not every week, because I'm too type A to have ALL my meals planned out for me). The problem is, I got lazy and didn't do the prep work, and then I got busy at work, and couldn't get home in time to make the planned meals. So it didn't go so well this week (not a knock against the service, which I think is great; more a knock against my organizational skills). 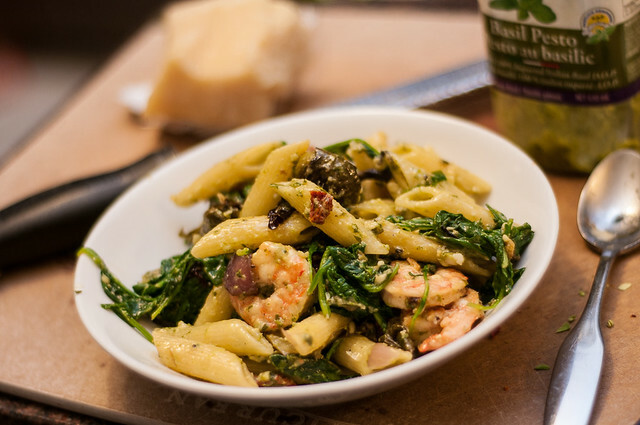 The net result is that at the end of the week, I had a bit of a random assortment of ingredients that needed using - arugula, pesto, shrimp and brussels sprouts. With the veggie/pesto combination, my first tendency might have been to go for a hearty bean/vegetable soup, but once I started thinking about the shrimp, I decided I really wanted pasta to be involved. So this dish is a bit random - it has roasted vegetables (brussels sprouts and red onion), because the roasting takes a lot of the cabbage-y taste out of the sprouts, and turns them a bit sweet and super delicious. I threw red onion in, because, well, red onion is great roasted. I quickly sautéed the shrimp, and then steamed some greens over top. I might have been a little overly enthusiastic in the amount of greens I added, but given how good they are for you, I think it's a good amount, as long as you like them. So basically what I'm saying is that I don't think this dish will convert people to loving greens....but if you DO like them, then you'll love the dish. Dark leafy greens are pretty much the healthiest food you can eat, so we should all eat more anyway. ;) Plus, this is a great way to use them up if you initially thought you'd gorge yourself on salad, and then you get lazy and end up with a tub of not-rotten-but-well-on-their-way greens. Stir fry is great for that too. Last, I had a half-jar of pesto that was set to expire in a few days, so I thought it would be great with this. I often get the Kirkland brand pesto from Costco, because I love the fresh flavour and the bright green colour. Given the price of fresh basil in these here parts (about $2 for a tiny little bunch), purchased pesto is definitely the economical choice. It all came together in a surprising, but super yum dish. The roasted veggies add some flavour and sweetness, and the greens add a nice earthiness to the dish. 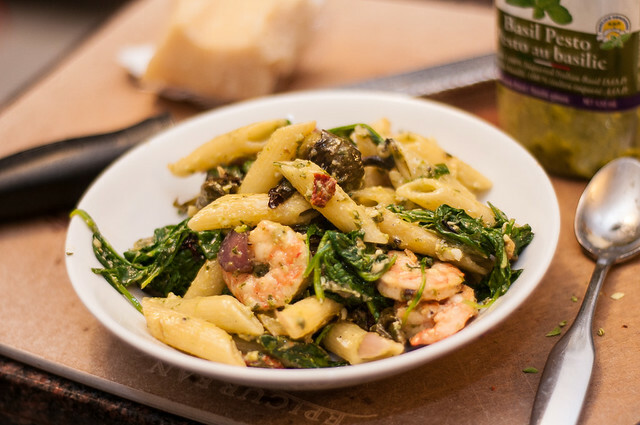 You could easily change up any of the ingredients - roast peppers and mushrooms, change the arugula for spinach, kale or another dark green, skip the shrimp, or use chicken instead. 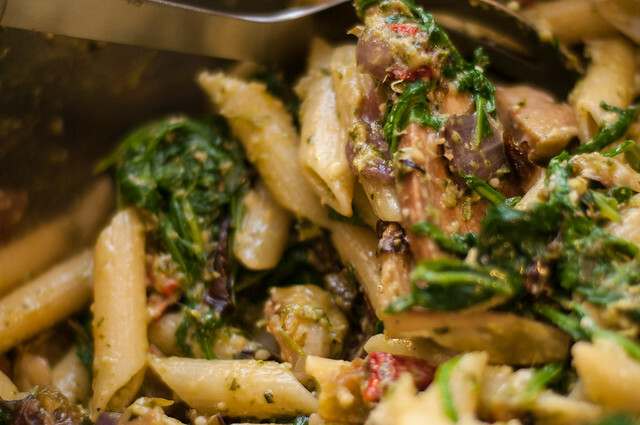 Sundried tomato pesto would be a good change-up too. I threw some sundried tomatoes in as well, but I think I should have added them earlier, because they were still a bit on the chewy side. Still tasty though, and offering little bursts of tomato flavour. 1. Preheat oven to 400F. 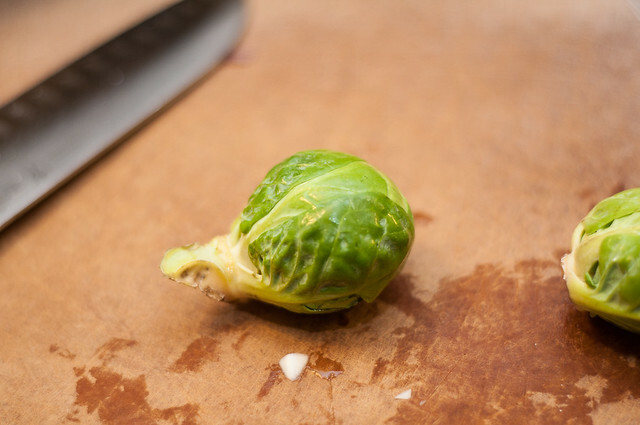 Prep your brussels sprouts by washing them, trimming the little stem bits, and halving or quartering them, depending on size (mine were pretty big). Chop your red onion. 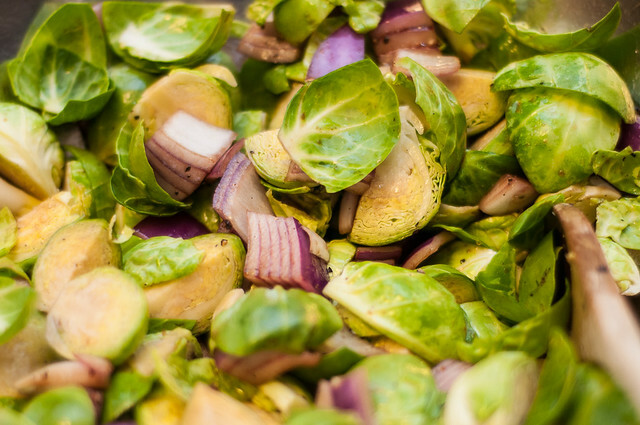 Combine the sprouts, onion, olive oil, balsamic vinegar, salt and pepper. Spread on a baking sheet (I cover mine with parchment or a silpat to prevent sticking). Bake for about 35 minutes, stirring half-way through. 2. Now, put a large pot of water on to boil. (now is a good time to set the table or make salad, because you have about 15 minutes to kill here). 3. 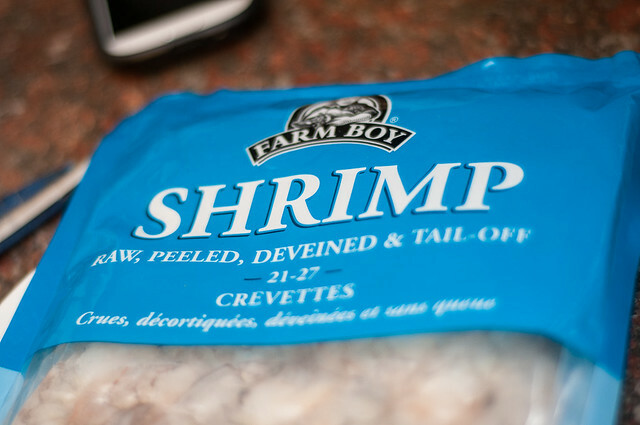 When you have about 15 minutes left on the oven timer, start preheating a large frying pan for your shrimp. Add pasta and sundried tomatoes to boiling water (add about 1T salt to the water). Cook according to package directions (probably around 10 minutes). Now add the oil to the pan, then the shrimp and cook until they are opaque (this will depend on the size of shrimp - I use 21/27 size and they usually take about 4 minutes). 4. 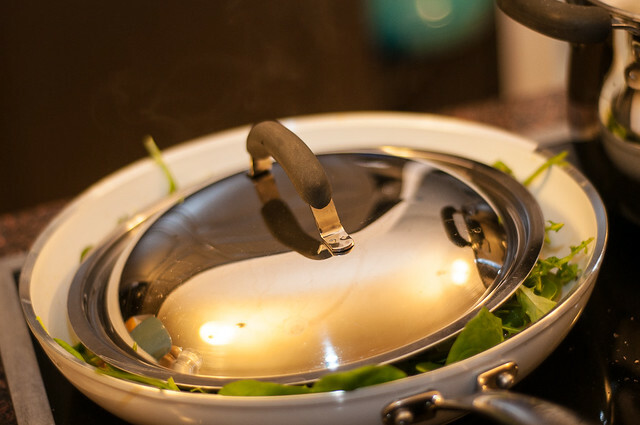 Remove shrimp from pan (but don't clean it out), return pan to heat, and add greens. They will barely fit, and this is okay. They shrink a lot. To help them shrink, I like to get fancy and steal the lid from the pasta pot. It will take about 5-6 minutes, but if you cover your greens, stir them every couple of minutes, they will quickly wilt. Return the shrimp to the pan. 4. Using a mug or glass measuring cup, scoop up a bit of the pasta water (no more than a cup). Drain the pasta when it reaches al dente texture. 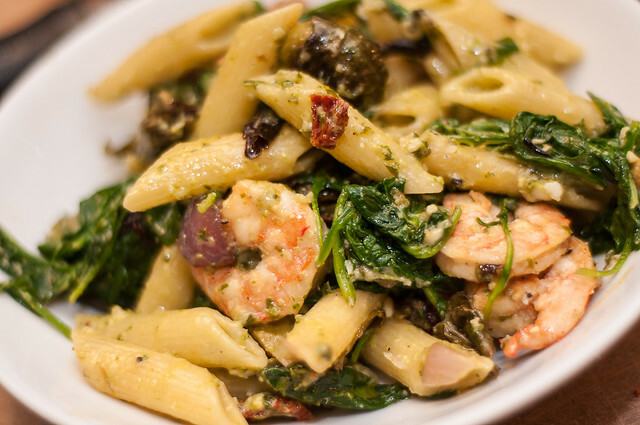 Return the pasta to the pan, add in the roasted veggies, the sauteed greens and the shrimp, and combine. Add in the pesto and stir until covered. If you find the mixture dry, you can add some of the cooking water. Enjoy with parmesan cheese and/or pepper. My mouth is watering here! 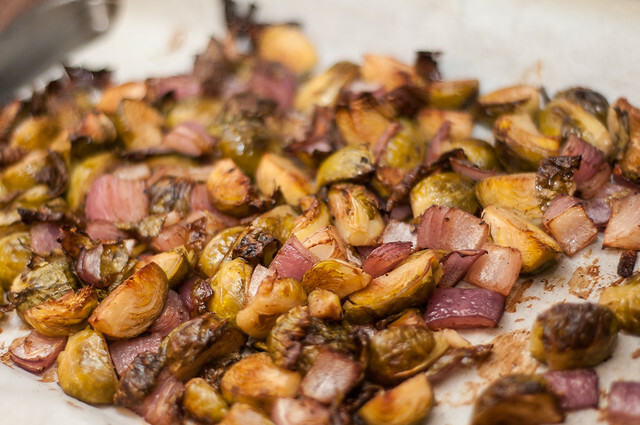 What I like best is the fact you used random veggies and roasted they just looked amazing, I would not have thought to use the Brussels sprouts that way, I must try it!